1. Italeri's 1:72 EH 101 Merlin HAS.1 #1219 was released this week, the first of a line of kits that will include Revell's RAF Merlin HC.3 #4468, due later this month, and Italeri's CH-149 Cormorant #1226 later in the year. Moulded on three sprues of pale grey plastic, the parts look clean and well detailed. 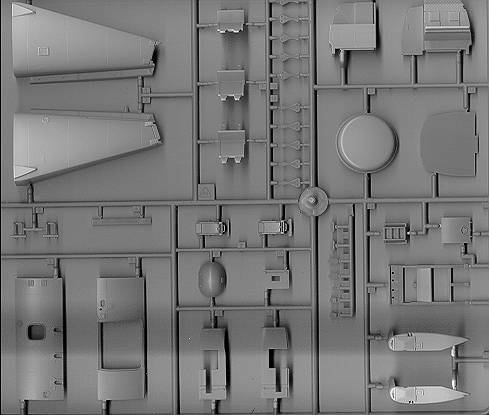 Panel lines are for the most part restrained and finely engraved, with the exception of those on the engine and exhaust covers, which are at least 0.5mm wide and deep. As expected the rear section of the fuselage is moulded separately from the main body to facilitate the production of the different versions mentioned above. The fuselage side panels containing the door and window openings are also separate for the same reason. The cabin is fitted with a two-seat sonar/weapons control station as well as three other pairs of seats that with a bit of extra detail should give it a suitably busy look. The control console and the instrument panels in the cockpit are almost completely devoid of any raised detail, the instrument faces and VDU screens all being supplied as decals. A similar approach has been taken with the seats, which have no moulded harnesses; again decals are supplied. This approach will make the application of scratch-built or aftermarket parts significantly easier. The cabin is fitted with a ceiling, the top surface of which includes a selection of boxes and hydraulic or electric lines that will be visible through the rotor mast opening. The forward and main wheel-wells are also detailed, but unfortunately these are somewhat spoiled by prominent ejector-pin marks, as are the internal bulkheads. The tail-fold mechanism can be assembled so that it moves. The hinge itself looks rather prominent, but the real thing is also decidedly substantial, so the effect ought to be fairly realistic. The main rotor blades can be assembled in the extended or folded positions, and can probably also be left free-moving if desired. The effect here is perhaps somewhat less convincing, one suspects that to some extent accuracy has been sacrificed in the interest of novelty. 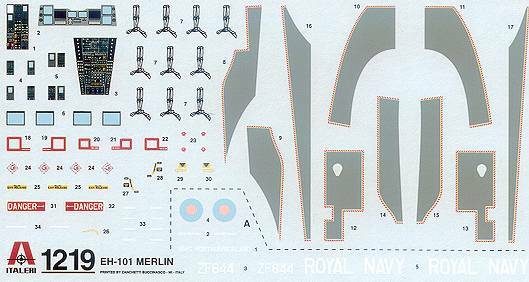 The decal sheet gives markings for a single aircraft, ZF644, with 'HMS Northumberland' on the nose. Apart from the seat belt and instrument decals there are ten walkways for the upper surfaces and a limited and I believe mostly inaccurate set of stencils. 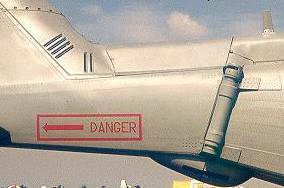 Among other things I have doubts regarding the colour of the 'DANGER' warnings because most photos appear to show red text over fuselage grey (though I don't have pictures of this particular aircraft). Overall this appears to be a very nice kit, slightly spoiled by some exaggerated panel lines, the ejector pin marks and by the decals. Interestingly, the instructions and the small print on the box claim that the EH 101 is "used as an attack helicopter by the US Marines"! 2. 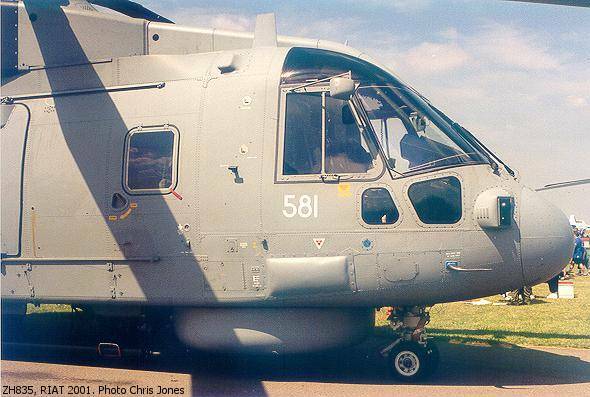 The following is a distillation of Jay Carrell's observations on the Italeri 1:48 MH-60G #2612 which was released in January (see HKN #137 & the HKN Discussion Group), to which I have added a few extra thoughts on the rotor fold. This kit is an improvement in comparison with the Academy/Minicraft H-60 family, but not a great leap forward. The Italeri mould has a few more panel lines, some raised and some recessed, plus both raised and recessed rivets. There is perhaps a bit more flash than one would like around some of the smaller parts. The port pilot door is a separate piece so it can be opened or closed, but there is little or no interior detail. The instrument panel hood is about the right shape and much better than the totally wrong Academy hood. The panel devoid of detail, decals are provided for the instrument panel and centre console. The floor in the troop compartment has more detail than the Academy. Pilot seats are crude but you do get some seat side armour shields. There are no ESSS pylons or tanks included in this version. The armament (miniguns and .50 cals with mounting plates and ammo cans) looks okay. The guns seem slightly smaller than those in the Academy kit. The refuelling probe is also smaller in diameter than that in the Academy kit, which looks wrong, and the external wiring for the probe is moulded onto the surface. The braces and steps around the probe and its attachment point look good though. Probably the biggest improvement over the Academy kit is the HIRSS assembly. The Italeri kit has a more accurate looking exhaust system, but there's a lot of flash in this area. The Italeri and Academy fuselages match up almost exactly when put together. The main rotor and hub look good too. The blades can be positioned in a folded position approximating to that used when loading the Blackhawk family into an aircraft hold for transport. In real life the two outer blades are completely detached and a longish spacer is inserted between the hinge on the blade and the hinge on the hub, this provides the necessary clearance between the two outer blades and the two inner blades (the fifth blade is not folded). In the kit two of the blades (part #6) and another two (#7) have their locator pins in different positions. This allows them to be folded back in a manner very roughly resembling the real arrangement. The Seahawk, which Italeri will release in 1:48 later this year, has a completely different automatic blade-folding mechanism. The Italeri windshield is different from the Academy's. The latter gives you a the windshield and overhead windows in one piece. Italeri's assembly comes in four separate parts, the fit of which appears to be less than perfect. There are raised rivets around some of the edges of the overhead piece which will probably have to be sanded off when filling the gaps. Finally, Jay reports that the Italeri forward stub wings (below the cockpit doors) are very tricky and a difficult fit. He was unable to get his mounted symmetrically, the left one being noticeably lower than the right. Academy's mounting outline for the stub wings appears to be more satisfactory. 4. I got another message from Navigator about glazing for their 1:35 Mi-24 (HKN #137). It appears to say that vacform canopies and other windows are included in the kit. 32004, XM-23 M-60 machine gun set, target kit Revell UH-1D/H #4421, 4422, etc. 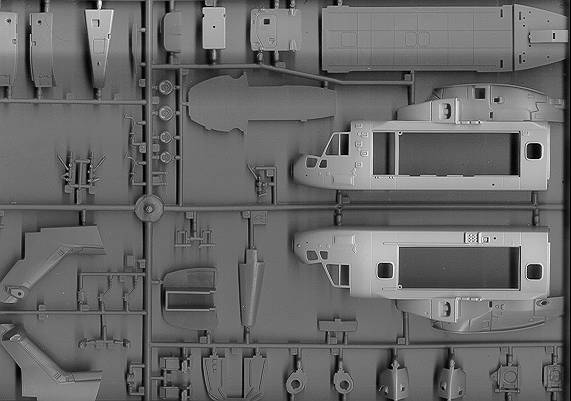 The instruction sheets for the 1:35 MH-6J conversion will be completed this week, perhaps within a day or so, with release immediately after. 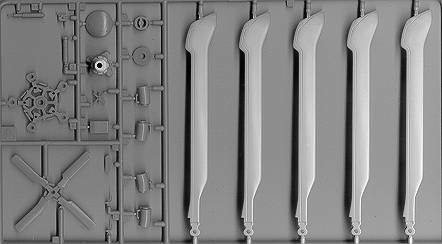 The first castings for 1:35 UH-60L update have also been completed. Cobra have confirmed the configuration of the MH-60L aircraft as they were flown in the Somalia incident (Black Hawk Down) and also the current configuration. Work on a MH-60L detail set has begun. Look for it to be completed in March or April. Some or all of these H-60 sets will also be released in 1:48 during the next few months; there is also the possibility of some in 1:72. 32094, 1:32 US WWII & modern helicopter 'poseable' seatbelts. 8. As ever, I include news of Avro 504K kits because of their interest to Cierva gyro converters. A new 1:48 kit of this aircraft has been announced by Blue Max, #206. 10. Again I'm not sure how new this is, but Hasegawa have reboxed the Dragon 1:35 OH-6D with the same JMSDF markings and red/orange/yellow scheme as were previously supplied in their 1:48 kit #09342. This one is numbered 86822/HD22, and may only be available in Japan. Thanks to Jay Carrell, Tony Morgan, Yevgeny Borissov, Chris Miller (Cobra Company), George Findlay (Models Unlimited) and David Campbell.